S.B. Slijper, Blaricum (circa 1919). Dr. and Mrs. Norman Laskey, New York. Sidney Janis Gallery, New York (1960-1962). M.G. Ottolenghi, L'opera completa di Mondrian, Milan, 1974, p.101, no. 220 (illustrated). J. Holtzman, "Piet Mondrian: The Man and His Work," in H. Holtzman and M.S. James, eds., The New Art--The New Life: The Collected Writings of Piet Mondrian, Boston, 1986, fig. 60 (illustrated). R.P. Welsh, Piet Mondrian: Catalogue Raisonn of the Naturalistic Works (until early 1911), New York, 1998, vol. I, pp. 464-465, no. A703 (illustrated). Amsterdam, Stedelijk Museum, Hollandsche Kunstenaarskring: Schilderijen, Beeldhouwwerken en Teekeningen, March-April 1922. New York, Sidney Janis Gallery, 50 Years of Mondrian, November 1953, no. 10. New York, Sidney Janis Gallery, Paintings by Mondrian: Early & Late Work in Progress, January-February 1962, no. 12. Dallas, Museum for Contemporary Arts, Dallas Collects, August-September 1962. Dallas, Museum of Fine Arts, Dallas Collects, summer 1963. New York, Sidney Janis Gallery, Paintings, Drawings and Watercolors by Piet Mondrian, November 1963, no. 16 (illustrated). Santa Barbara, Museum of Art; Dallas, Museum of Fine Arts, and Washington, D.C., Gallery of Modern Art, Piet Mondrian, January-June 1965, no. 29 (illustrated). New York, The Solomon R. Guggenheim Museum, Piet Mondrian, 1872-1944: Centennial Exhibition, October-December 1971, p. 121, no. 38 (illustrated). Dallas, Museum of Fine Arts, Dallas Collects: Impressionist and Early Modern Masters, January-February 1978, no. 69 (illustrated). The present picture belongs to a small series of pointillist works painted in Zeeland between 1908 and 1910. The horizon and contour of the dunes appear high in the composition, focusing the eye of the viewer on the dappled sunlight in the hollows and slopes of the dunes which has been described by short staccato pointillist brushstrokes. The resulting composition is a smooth transition from the depiction of the dunes to the sea to the sky - in the simple treatment of which Mondrian has achieved a greater level of abstraction than was ever achieved by his contemporaries Jan Toorop and Jan Sluijters. The sand dune, shaped by the forces of nature such as wind and ocean, acts as a natural barrier against the advance of the sea--an omnipresent concern for the inhabitants of Holland since so much of the country is threatened by the sea--in the present work, by editing human presence and activity from the landscape, Mondrian has succeeded in bestowing upon the dunes a monumental presence, unspecified in time and unrestricted in space. 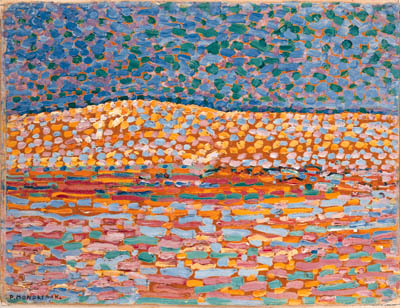 In 1909 Mondrian wrote in a letter to the art critic Israel Querido that "I believe it definitely necessary in our period that the paint be applied as far as possible in pure colors set next to each other in a pointillist or diffuse manner...for it seems to me that clarity of thought should be accompanied by clarity of technique." (Quoted in M.S. James, "Piet Mondrian--Art and Theory to 1917", in H. Holtzman and M.S. James, eds., op. cit.,, pp. 13-14). This was to prove not only an expression of his thought-process at that time, but also prefigured the artistic route he was to follow for the rest of his career. The majority of works from the series of Dune compositions are housed in the Haags Gemeentemuseum, 's-Gravenhaage. Other examples are to be found at Yale University Art Gallery, New Haven and at The Museum of Modern Art, New York.